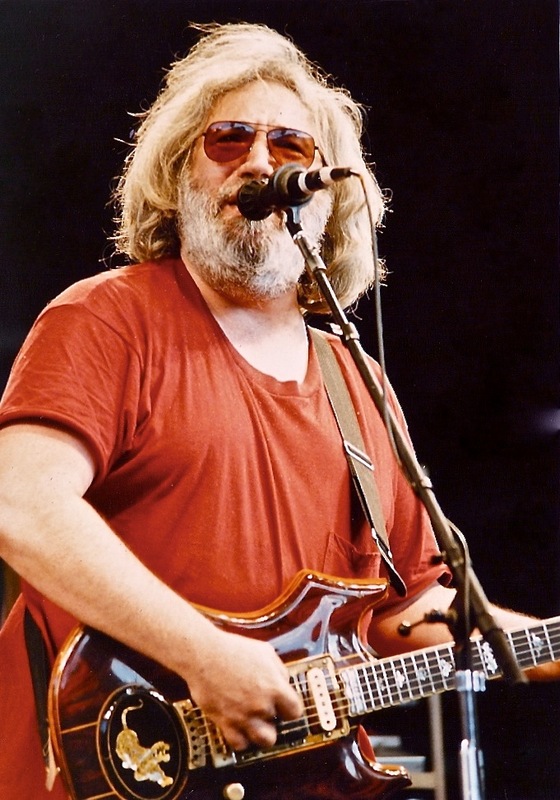 Grateful Dead lead singer Jerry Garcia in 1987. Recently the core four of the Grateful Dead announced the concerts they played in Santa Clara on June 27 and 28 and Chicago on July 3, 4 and 5 would be their last – ever. They were called “Fare Thee Well: celebrating 50 Years of the Grateful Dead”. I never had a long association with the band but, for a few months in 1987, they enjoyed their greatest commercial success. It is that time I recall fondly. It was 28 years ago this month the Grateful Dead released the album, “In the Dark”. The single “Touch of Grey” hit the airwaves about the same time. What set the Grateful Dead apart, was their fans. Called “Deadheads” they perpetually supported the band, turning out in droves for their live concerts, often following them from concert to concert. They may have had little to no commercial success via radio hits or studio record sales, but they still were extremely successful, selling in excess of 35 million albums worldwide. Heading the band was their illustrious leader Jerry Garcia who, for the uninformed like myself, was the face of the Grateful Dead. He was a presence on stage too, a big man with a big white beard. It is his voice that powers “Touch of Grey”. The single was released during the summer of 1987, right after I finished high school and was heading to university in Edmonton. When I moved up to Edmonton to the Kelsey Hall student residence, “Touch of Grey” was strong on the charts. Each floor in res had a floor coordinator, a senior student to look after things. Our coordinator had a copy of “In the Dark”, and that was the first time I heard the album beginning to end. It was the only time actually. The music video accompanying the single was also quite memorable. Initially, it appears to be a live concert. We soon discover, it is a band of skeletons (skillfully crafted marionettes) who are performing “live”. Eventually they become the actual band playing on stage. “Touch of Grey” was a catchy tune that peaked at number nine on the Billboard Hot 100 charts. The Grateful Dead had never experienced that kind of chart success before, and would never repeat it. Interesting for a band, continually voted one of the 100 best of all time. The band would go on to more success in the late 1980s and early 1990s. What I found interesting was one of my favourite artists, Bruce Hornsby, joined the Grateful Dead to tour with them from 1990 to 1992. He also joined them for their “Fare Thee Well: celebrating 50 Years of the Grateful Dead” concerts in Santa Clara and Chicago. Jerry Garcia would die in 1995, signaling the official end of the band. So much of my music was derived from radio. It was my exposure to the Grateful Dead, ironically through their biggest chart success, that made me realize how much more there is to music. Beyond listening to the radio, finding out what I liked, and buying the tape or record, there was so much more. It would be another year before I went to my first concert, where I discovered how different a live show was. There was improvising, experimenting, trying out new material, and just jamming. The sound was more raw and real, free of the processing studio recording provides, and filled with creativity. It is something I’m sure kept Deadheads coming back.